This beautiful silk midi dress was created to ultimate flatter your figure and to provide hours of comfortable wear. 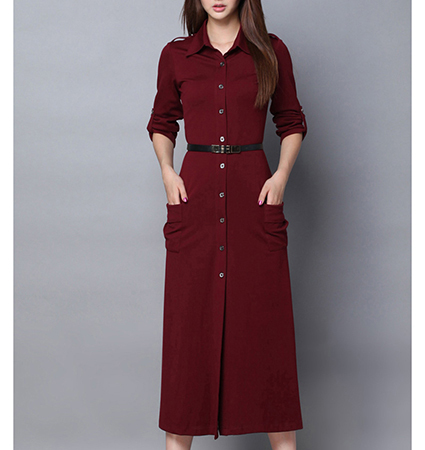 It features a traditional cut with a pointed collar and button front . It is presented in a lovely wine color and has a contrasting, narrow black belt. The dress is an A-Line style, which is one of our most flattering, popular styles. The dress has long sleeves that may be worn full length or pushed up. (as shown). The length of this dress ends at the mid calf area. We recommend dry cleaning only for this dress. It is available for purchase in sizes Small, Medium, Large and Extra Large.